hiring of muscle power from unemployed youth of Somalia. hiring of poor fishermen of Somalia to provide boats and navigational skills. paying foreign businessmen to provide weapons, satellite phones, luxury vehicles to move on land. seizing of merchant vessels, looking after the hostages well and collect ransom money from ship owners. During the United Nations Security Council’s 6473rd Meeting (AM) on January 25, 2011 Mr Jack Lang, the Secretary-General’s Special Adviser on the legal issues has warned that “In Race between Pirates and International Community, Pirates Clearly Winning”. 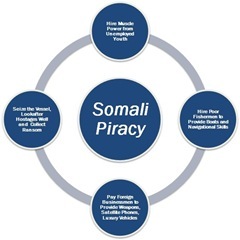 During this same meeting, Ambassador Hardeep Singh Puri, Permanent Representative at United Nations, has suggested the following five point program to stop Somali Piracy. Reinforcing the tracking of ransom money around the world. Prosecuting the beneficiaries of ransom money collected. Considering the conduct of naval operations under the United Nations. Sanitizing the Somali coastline through identified “buffer zones”. Enacting national laws criminalizing piracy. 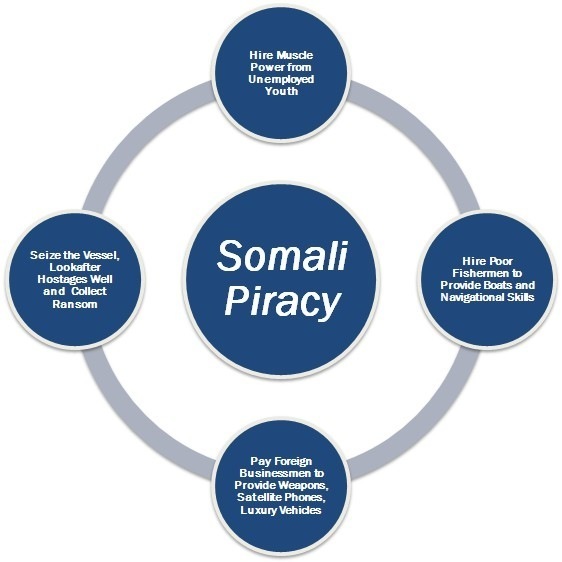 Read the full text from the Meetings Coverage & Press Releases issued by the United Nations titled: In Race between Pirates and International Community, Pirates Clearly Winning, Secretary-General’s Top Legal Adviser on Piracy Warns Security Council.